The living world is civilized by the vision and the power of Rome. But not all that walks is living, and not all that falls will die. We are but shadows and worms, consigned to the earth and shamed by our incompletion. And that which is not conquered by the children of Romulus shall submit to his brother's get. * Everything you need to play Vampire: The Requiem from the earliest nights of Rome to the ruination of Kindred society, including new blood magic and a new clan! * A grotesque and beautiful new vision of Ancient Rome through the eyes of vampires - full of bloody passion, mystical intrigue, and glorious battle. * The secrets of the ancient undead, revealed at last! Learn the truth about the Camarilla, claim rule over the vampire city called Necropolis, and confront the wicked and terrifying monsters that prey on the undead - the Strix! 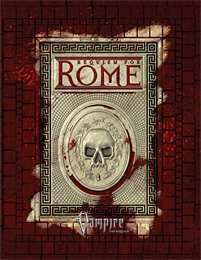 Requiem for Rome is a supplement for the World of Darkness game Vampire: The Requiem.